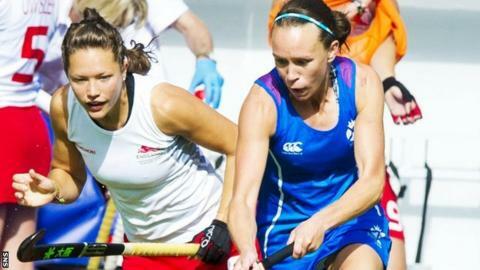 Scotland midfielder Nikki Kidd has announced her retirement from international hockey. The 28-year-old won the first of her 170 caps in 2005 and went on to score 64 goals for her country. "I have decided after 11 brilliant years in the senior squad that it is time for me to move on to other things," said Kidd. "I have had a fantastic international career and I feel hugely honoured to have represented Scotland 170 times." Kidd, a penalty corner expert who will continue to play for Mannheimer in Germany's Bundesliga, featured in the Scotland squad in three Commonwealth Games, the last in Glasgow in 2014, and in that year she was part of the Great Britain performance programme. Her performances in the 2013 and 2015 EuroHockey Nations Championships were vital to the team retaining their place for consecutive continental campaigns. "I want to express my gratitude to all the players, coaches and support staff for giving me these fantastic opportunities and allowing me to be part of something which will always be very special to me," said the former Ellon Ladies, Bon Accord MBC, Grove Menzieshill and Edinburgh University player. "I have always given absolutely everything I have out on the pitch, in training and in the gym. "I have lived every day for the past 11 years to be the best athlete I can possibly be. I wish the squad all the very best for the future." Scotland Women head coach Gordon Shepherd added: "Nikki has been an exceptional player for Scotland, a regular scorer of goals and an important member of the squad for three Commonwealth Games. "She has served her country well, demonstrating the highest standards and setting an example to players about the right attitude to training and preparation. "Overall, she has been a fantastic role model for the players and she leaves with both my and the squad's best wishes for the future."